“Occasions for stumbling are bound to come but woe to anyone by whom they come. My interpretation of this scripture is underpinned by two points.The first point is to forgive those people who I believe have undermined by ability to achieve my goals along the way. Too often I can fall into the trap of pointing the finger for my failings on others or circumstances instead of reflecting on my role in the situation. The second point is not to blame anyone or any circumstance for the challenges I face.I think sometimes it is too easy to believe my lack of opportunities are caused by people or circumstances, rather than the role I may play in that situation. It calls perhaps for me to have a rethink and focus on how I could have made the opportunity a success rather than a challenge. Hence we are responsible for what we do in our lives. When circumstances don’t favour us we need to be resilient and rise to the next challenge. Furthermore, I can’t afford to play the blame game but try to forgive those who I perceive to have put obstacles in my way so I couldn’t maximise my opportunities. Thus, ultimately, the message I take from the scripture is that I don’t sit in judgement of anyone, only myself. Just like a family, a group of friends or a sporting team if they are all united they experience the disappointments along with celebrations of others within these groups. What Saint Paul is imploring us to do as a Church is to evangelise the world with the “Good News of Jesus Christ” modelling a united Body of Christ. So how do we do that? I think what Churches need to do is ensure that throughout the world they are modelling a culture of community. A culture where everyone builds relationships both with each other and with God. I feel if they are to build this culture of relationships they need to be passionate about their community. They need to be inclusive of all members by being invitational providing committees and groups as well as social and parish celebrations to make connections with their own Church Community. I think it is extremely important that everyone can find a group that they can identify with and feel they can make a contribution. Furthermore, I would argue that a goal of each of the groups would be to reach out to members of the Church to participate in their group. This not only assists the sustainability of their group but also that all members of community have been touched by the Church. I believe Model of the Church is alive when everyone feels like they belong and work together to contribute and support the Community then we realise each part is connected to a healthy body of Christ. In Luke 14:7-14 Jesus’s states that when you are invited to a wedding banquet not to sit in the place of honour but to sit at the lowest table. Additionally, be inclusive of everyone not just celebrate with your family and friends. 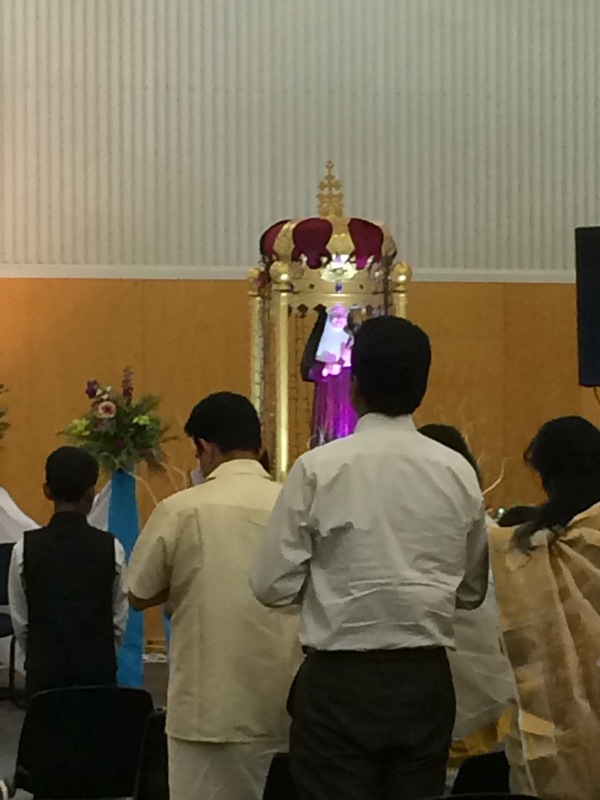 Last Sunday, I was invited by the Adelaide Northern Syro-Malabar Community to celebrate the Feast of Saint Euphrasia. When I arrived I was welcomed and ushered to go to the place of honour. Immediately I felt part of their community even though I was not familiar with the story of Saint Euphrasia, did not share their cultural heritage and speak or understand their language that they spoke in the mass. What struck me was the Syro-Malabar Community’s transformation of our school hall with their sacred statue of Saint Euphrasia behind a glass statue with adorning lights, the sanctuary covered in red fabric, the altar decorated with an ornamental cloth and on the other side of the sanctuary a a beautiful statue of Mary. Immediately it was clearly visible that this was a mass dedicated to Feast of Saint Euphrasia. Moreover, I felt their acceptance of me as a stranger but also of each other. For example, a baby was crying throughout the ceremony but no one frowned or commented the mass just continued as though this didn’t happen. Furthermore, when I looked out in the assembled in the gathering I saw a sea of colour of families singing and praying. Then the mass evolved into acknowledging those who contributed to the community through gift giving, followed by a procession around the school grounds and concluded in a shared meal. They were just like the Early Christian Communities, Acts 2:46 “Day by day in the temple, they broke bread, ate their food with glad and generous hearts, praising God and having the goodwill of all people. 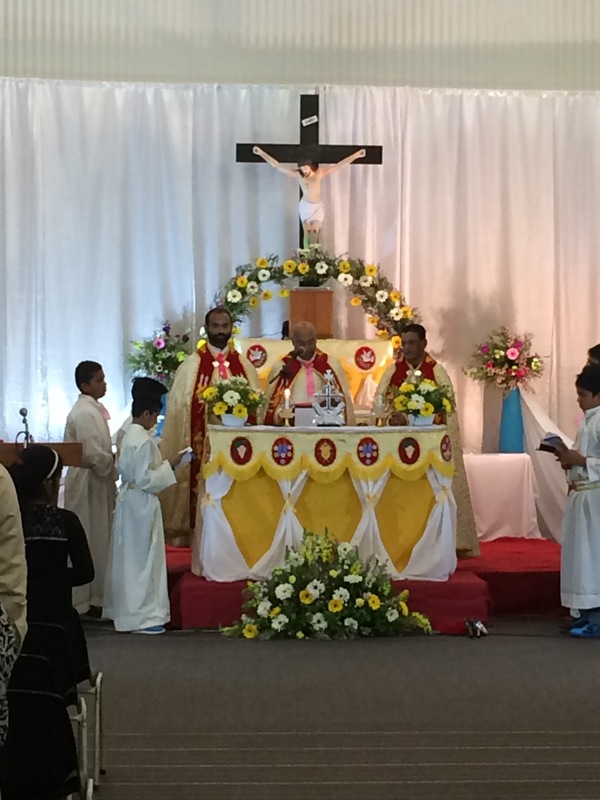 Perhaps the Adelaide Northern Syro-Malabar Community are not only a model of the Early Church but a signpost to the Church of the future.